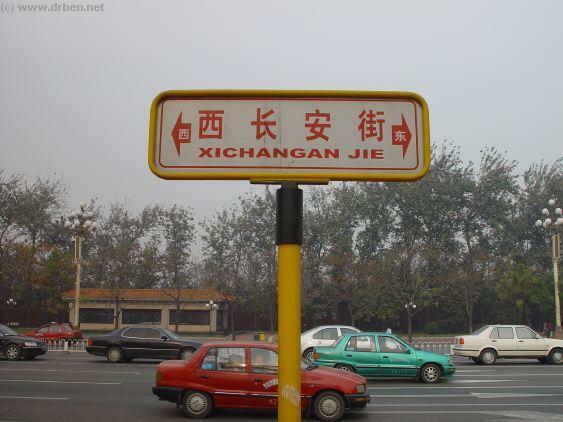 One cannot miss the Gate of New China (Xinhua Men), although there is a considerable walking distance between the two gates. 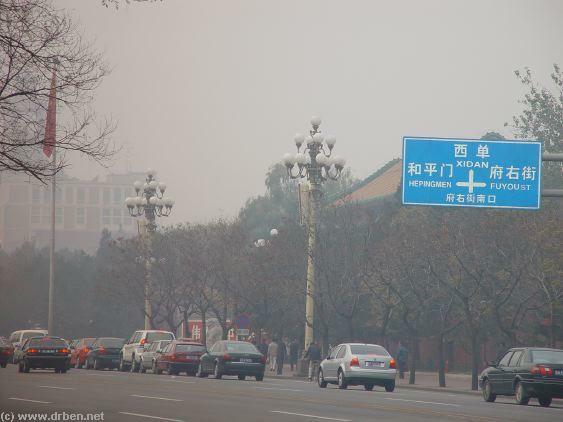 To be exact ,when walking from Tian'An Men to Xinhua Men one passes first the entrance Gate to Sun Yat-Sen Park (Zhongshan Gongyuan) on the North Side of west Chang'An Avenue. Just beyond and across stands the north flank of The Great Hall of the Peoples (Renmin Dahui Tang). just West of it the brandnew National Theatre Dome designed and built to replace the small Beijing Concert Hall left after the Cultural Revolution Era and Mao Zedong's death in 1976. The new National Theatre, of course, was built in advance of the 2008 Beijing Olympic Games, and has been open and functioning since November of 2007. It is THE Top Theatre in all of China and an achievement of modern architecture as well. 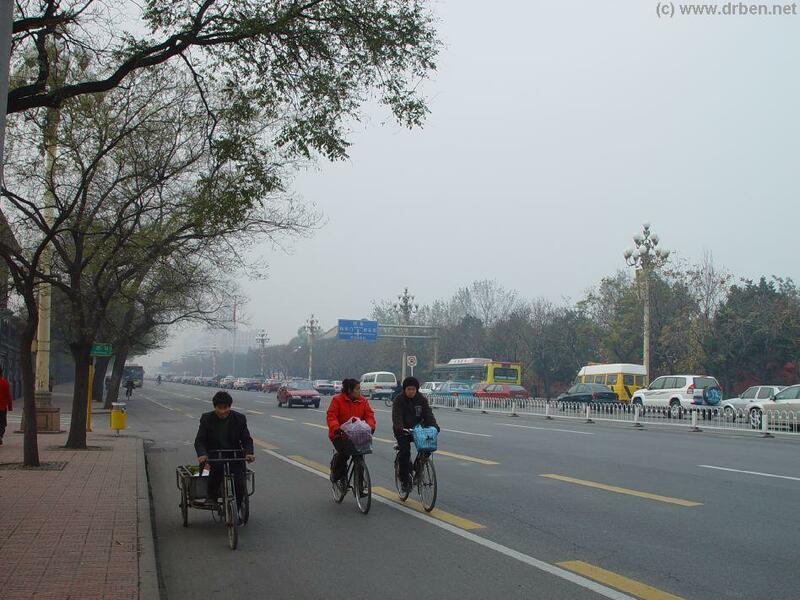 Enjoy the scenery, while walking down the unusually wide and tree lined West Chang An Avenue. Looking back you will see the width and length of this longest boulevard in Asia, with the Gate of Heavenly Peace getting smaller in the distance. Passing the first brushed around NanHai, former Imperial Pleasure Garden, west of ZhongShan Park, part of the Former Imperial Palace. As for how to find the Gate of New China and the Zhongnanhai Complex, all of this relatively easy even within such a huge city as Beijing. Simply put, anyone who can locate the Square of Heavenly Peace (Tian'Anmen Square) and its Gate of Heavenly Peace (Tian'Anmen), the entrance to the Palace Museum (Gugong) if you will, can locate Zhongnanhai and the Gate of new China. For a general idea of the city lay-out and the position of the Gate within it, have a look at the adjacent Map. To find your way to the Gate of New China, simply find the Palace Museum at the center of the Map. The Emperor, after all was the center of the earthly realm, Zhongguo, the middle Kingdom. The Gate of Heavenly Peace, as described, is the South Gate of the Imperial Palace, now the Museum. As such, the Square of Heavenly Peace lies south of it. Once centered on Tian'Anmen, the Gate of Heavenly Peace, simply follow Chang An Avenue to the West. extended families. Zhongnanhai was the Official Residence of Mao Zedong during his lengthy stint in Beijing as 'Chairman Mao', the de facto Leader of the Chinese People, Commander in the Chief of the Army of the Communist Party, father of the Nation, Great Red Sun in the East warming Chinese hearts. Zhongnanhai, specifically the number 202 building, was also the location where Mao Zedong died. Due to this important function as the Top Leadership's Compound, specifically the home of the dictatorial Mao Zedong, Zhongnanhai is legendary, famous but as a consequence also highly secluded, secretive and off limits to just about everyone. 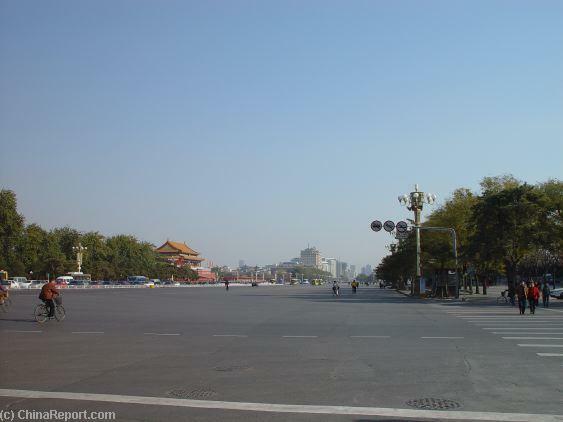 Zhongnanhai, it is said, is the zone with the highest security in the entire city of Beijing, even more so then the symbolic Square of Heavenly Peace (Tian'AnMen Square) . Bicyclist pedal away along West Chang An Avenue in November 2004, as they have done since human memory. Today however, electrically powered bicycles are popular, and almost the norm. conservative Grandmother, the Empress-Dowager Cixi. Cixi's Palace was situated in Zhongnanhai, thus, so was the jail. Guangxu's jail on Yingtai Island would be a tourist magnet, if it were open for public access. There is even more history to the Palace Garden than can be summed up here. Last but not least Zhongnanhai's Gate of new China has its very own but miniaturised version of the great National Flag Ceremony at Tiananmen Square. For all its history however, there is not that much to see at the Gate of New China itself. It is more what cannot be seen that attracts most visitors to this spot. Find out all you need on the Gate and the Complex below. Heavenly Peace (Photo: 2004 AD). 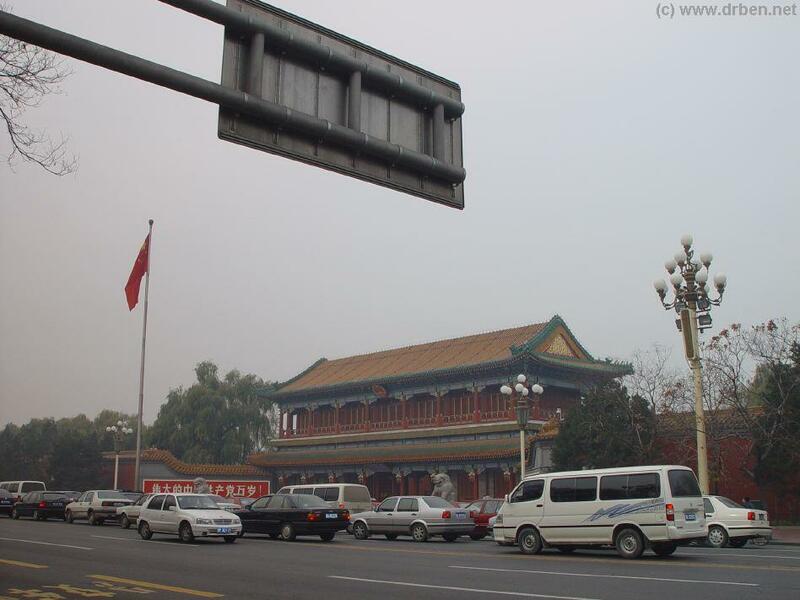 Traffic Jam on the Eternal Peace Boulevard in front of Zhongnanhai's South Gate of New China (Photo: 2004 AD). make a walk back to reach the North Side. Navigating around Zhongnanhai is explained later below in the section (3) lay-out and security. Although not easy to imagine it is possible somehow you may dwell past the Gate and miss it. Essentially, this is certain if the adjacent concrete tower comes into view. It is the tower of the Military Museum of the Chinese Peoples Revolution, a huge building itself, which stands quite some ways down the road to the West. 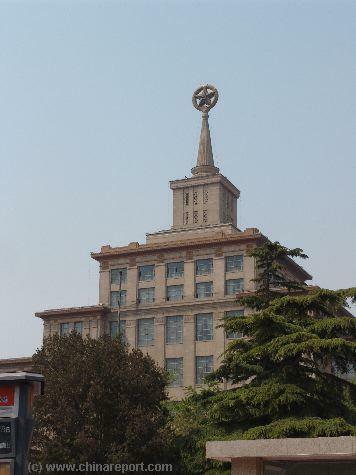 The Star and Tower of the Stalinist design Military Museum someways further west along Eternal Peace Boulevard from the Gate of New China (Photo: 2004). prefer the fastest and most direct transport can either take a Bus, or make use of the recently extended Subway/Metro system. Either way, there will be quite some walking involved. As you may imagine, it is not very wise to have oneself dropped off a car or taxi-cab right across from the Gate. Not only is this strictly forbidden and thus should land one in trouble by itself, given the wrong moves one might be mistaken for a protestor of some sort, or worse a possible terrorist, an attacker with violent intentions, someone who needs to be neutralized. Afterall, one might view Zhongnanhai as the Presidential Palace of China in Beijing, or China's 'White House' if you will. Security unfortunately is necessary and quite strict. It is nothing personal. So far all of the above has been hypothetical. Keep it that way by respecting the Guards at the Gate and following their instructions. 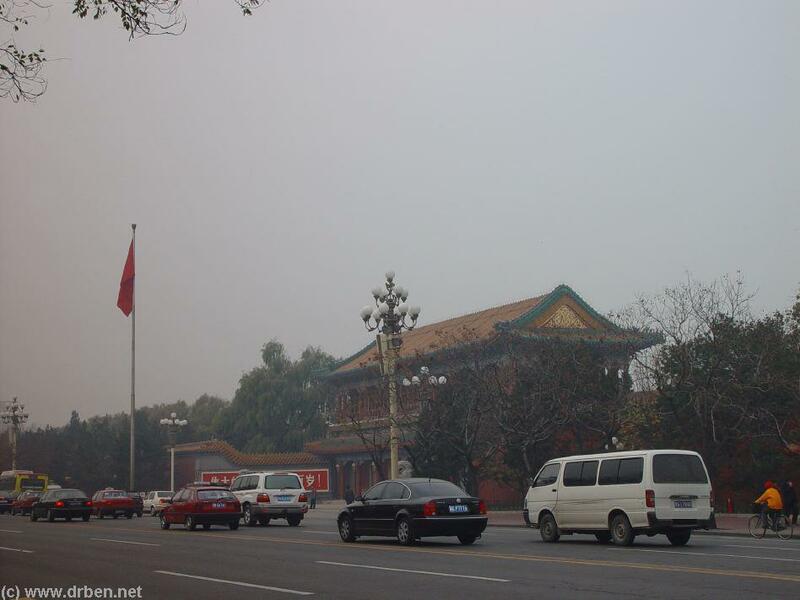 The continuous stream of car traffic blocking view of the colorful Xinhua Men, Gate of New China (Photo: 2004 AD). Eternal Peace Avenue. Where in the year 2000 one could easily walk across for the lack of car traffic even on this important thoroughfare, today traffic jams continue, except for late at night. Beyond the Gate of New China the Purple chalked wall continues for quite a stretch further west along (Xi) Chang Avenue until reaching Fuyou Jie, the road leading upward along the western flank of the Zhongnanhai Complex. To find out more about the perimeter, alternative gates and how to navigate around, check the adjacent digital map or other available maps, and read section (3) on the lay-out and security of Zhongnanhai Complex today. 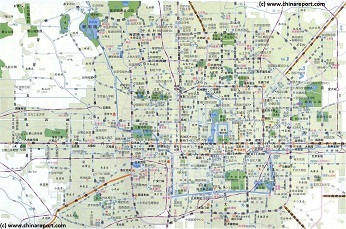 New addition; a Full Digital Map of the structures within central Beijing by GodEyes.Cn. 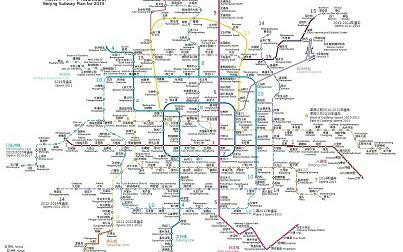 Browse around this cartoon like, game-play Map to enjoy Beijing in plus Zhongnanhai in a brandnew way !